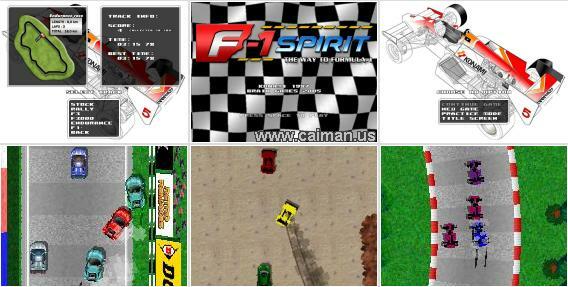 Caiman free games: F-1 spirit by Santi Ontanon - Braingames. 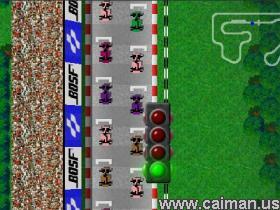 F-1 Spirit is a racing game. 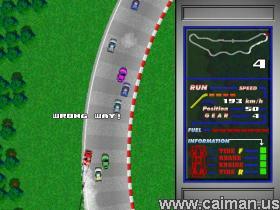 In this game you will race against some computer opponents (AI). Do not think it will be easy. Even the first tracks requires some practice. The game contains 21 tracks! (Stock race, Rally F3, race F3000, race Endurance, F1 races (16 tracks)). Although there are 21 tracks, at first you will be able to play just three. To unlock other tracks you need to earn points. 1st place=9 2nd=8 ... 9th=1 points. Although the first races look dificult at first they are easy compared to the F1 races. It looks impossible to win F1 races at first, but after some practice you will improve your skills. There are some TIPS which could help you a lot. Use Brakes, especially in the F-1 races! Use the PIT STOPS if your car has a lot of damage. For instance, having the engine damaged, your top speed will decrease, making you lose time in every lap. When you are in the PIT STOP and if you hold down the DOWN arrow, the fuel intake will slow down, but the car repair will speed up. The developers are very active and even planning to add a multiplayer function. Then you will be able to race against real people. shortcut on your desktop to play the game.